Since May 2011 I have been collecting material which points towards new ways of seeing the world, an echo of the society, technology, politics and people that co-produce them. The New Aesthetic is not a movement, it is not a thing which can be done. It is a series of artefacts of the heterogeneous network, which recognises differences, the gaps in our overlapping but distant realities. I say ‘objet’ deliberately: for Graham Harman fans, and even for those who aren’t, there are some remarkably interesting discussions that link the New Aesthetic to object-oriented ontology: see Ian Bogost, ‘The New Aesthetic needs to get weirder‘ (not as weird as the cutesy title suggests), Robert Jackson, ‘The banality of the new aesthetic‘ (a really helpful essay for other reasons too) and Greg Borenstein, ‘What it’s like to be a 21st century thing‘ (scroll down – much more there too). I started to follow the blog while I was working on a contribution to a conference on the Arab Uprisings [‘the Arab Spring’] held in Lund earlier this year: I’d been puzzled at the polarizing debate about whether (in the case of Tahrir Square in Cairo which most interested me, but much more generally too) whether this was ‘a Twitter revolution’ or whether it depended on what Judith Butler called (in a vitally important essay on the politics of the street to which I’ll return in a later post) ‘Bodies in Alliance‘. It seemed clear to me – and to her, as I discovered in a series of wonderfully helpful conversations when she visited Vancouver for the Wall Exchange in May) – that this was a false choice: that the activation of a digital public sphere was important, but so too, obviously, was the animation of a public space, and that the two were intimately – virtually and viscerally – entangled. In the same essay Edwards reflects on the compression of meaning imposed by the 140-character limit of each tweet, and he suggests that the immediacy and urgency that this form implies – even imposes – ‘calls forth an immediate, almost unmediated response, point, counterpoint and so on.’This is a persuasive suggestion, I think, but that response is surely to be found not only virtually (from tweets in cyberspace) but also viscerally (from bodies in the streets). 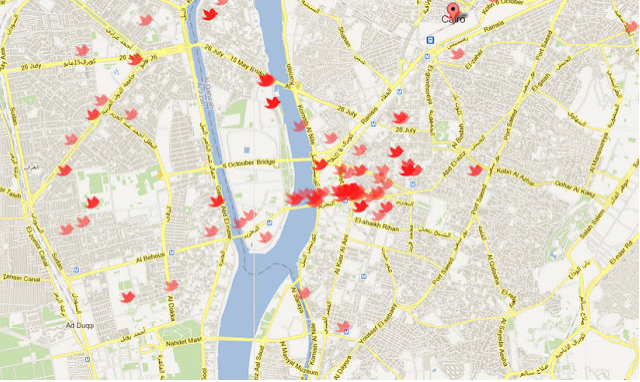 When we see maps … showing tweets in Cairo, we need to recognize that that these are not merely symbols in cartographic space or even messages in cyberspace: they are also markers of a corporeal presence. So I started to wonder about the politics of the New Aesthetic – especially when I returned from Lund to resume my work on the techno-cultural gaze that has been my preoccupation for even longer: the surveillance platforms of remotely piloted aircraft (and killing machines) like the Predator and the Reaper. (For a time the New Aesthetic was associated with the image of a pixellated Predator supported by balloons, ‘a bright cluster … tied to some huge, dark and lethal weight’, as Sterling put it). The virtual world is being integrated with the physical world and this seamlessness is presented as inherently good. No harm may be intended: it’s natural for a designer to want to smooth away the edges and conceal the joins. But in making these connections invisible and silent, the status quo is hard-wired into place, consent is bypassed and alternatives are deleted. This is, if you will, the New Anaesthetic. Instances of the New Aesthetic are often places where a glitch has exposed the underlying structure — the hardware and software. Or it is an oddity that has the unintended side effect of causing us to consider that structure. Part of a plane appearing in Google Maps makes us realise that we are looking at a mosaic of images taken by cameras far above us. We knew that already, right? Maybe we did. But a reminder may still be salutary. This is political. The New Aesthetic was accused of being apolitical — fascinated by the oddities and wonders being thrown up by drones and surveillance cameras without thinking about the politics behind them. This is plain wrong: politics seeps from nearly every pore of the New Aesthetic. It was often hard to see, but that’s what Bridle wanted to expose. The New Aesthetic is about seeing, then. And to see and be seen is to engage in those power relations. More to come – watch this space…. This entry was posted in Arab Spring, drones, visuality and tagged Graham Harman, James Bridle, Judith Butler by Derek Gregory. Bookmark the permalink.